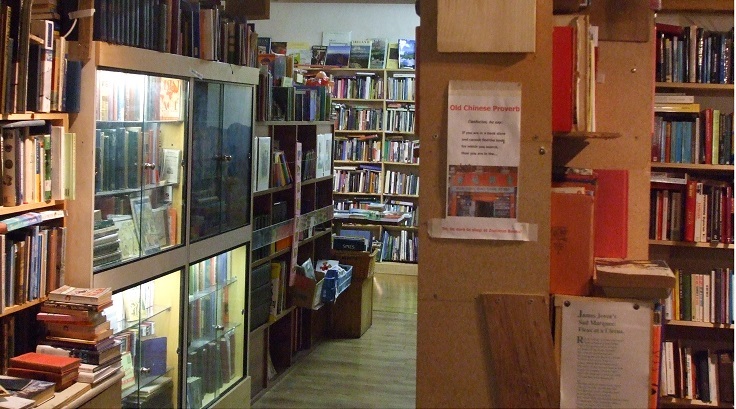 Zozimus Bookshop was founded in the autumn of 2011. It is a bookshop of the traditional sort, with a very wide range of hand-picked titles arranged by subject and in alphabetical order. Stock is largely secondhand, with a sprinkling of new books either written by local authors or of local interest. The shop is named in honour of Michael Moran (aka Zozimus), the balladeer and poet who in the early 19th century entertained his public in the streets of Dublin. The proprietor, John Wyse Jackson, is generally to be found on the premises from Tuesday to Saturday, 10 am to 5.30 pm, and is always ready to help with queries, to search for obscure out-of-print titles, or simply to recommend good books that you might like to read. His colleague, Althea Farren, is usually there at the same times on Mondays, and on Sunday between 12 noon and 4 pm. The shop is an ideal place to relax or meet friends, for it shares premises with the Book Café, a locally owned business offering good honest home-cooked food at reasonable prices. There was a time when most towns in Ireland boasted a second-hand bookshop that was worth visiting. Now few of them do. So we believe that if you are heading south or north along the east coast of Ireland, you will be pleased that you have come off the Gorey bypass to visit Zozimus Bookshop. It’s easy to find, inside the Book Café, half way up/down the Main Street of Gorey, at No 86 beside Boots the Chemist.